Peter Burnett offers a K-6 education program where students have the opportunity to grow and develop in a supporting, safe environment. Join our team! 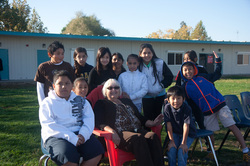 At Peter Burnett students are taught the Common Core Standards and Lifeskills using a variety of resources. Teachers use a Balance Literacy approach to teach students how to read and write. Student learn conceptual math before procedural math. Students are held to rigorous outcomes. Students demonstrate learning through various modes including ipads, laptops., and touch screen computers. Reader's Workshop and Writer's workshop are used to build and foster a passion for reading a love of writing. The Leader in Me is used to help foster and nurture Socio-Emotional Learning and build success and independence traits. When students learn to control their emotions, it opens the gateway for learning. Leadership skills are encouraged through Student Council, student jobs, and throughout the day. Students are encouraged to make decisions on behalf of the school that will help bring forth positive change. Our GATE program is from 4-6th grade. Students are challenged to be creative and to "Think Outside the Box. Come learn what GATE children can accomplish when they are allowed to flourish. Visit Ms. Green in 4 & 5th or Mr. Pike in 6th. The Visual and Performing Arts are important elements of our program. SIPPS- The SIPPS program is used to target Kinder-2nd grade students who may be having difficulties with reading. It is a phonics program that provides differentiated instruction to help our students succeed. Reading Buddies- Reading Partners buddies intervention for 2nd and 3rd grade students who may need more of a 1:1 approach. Community members are provided training to support student to develop fluency and comprehension skills. iReady- iReady helps assess all students and provide a diagnostic. The data provides teachers and parents with detailed data about the students performance level for both ELA and math. The program then prescribes lessons that target the student's ability level in both ELA and math. The lessons may be accessed from home. Socioemotional Support- Peter Burnett has a wealth of resources. All teachers engage in Leader in Me. A structured program that helps provide students the tools they need to handle problems,emotions, and life. The program teaches students how to handle social interactions so they can be successful in life. The school has a nurse twice a week and a school psychologist once a week.. All resources are designed to help students work through difficult times. If the school resources cannot support, referrals are made to outside agencies. Monthly Soaring Hawks Assemblies- The monthly assemblies are to recognize academic growth and leadership skills. We also have student present teach each other about Leader in Me. Ballet Folklorico- (MPR) Ballet Folklorico dance classes will be offered from Ballet Folklorico de Sacramento. Multicultural Art Class- Students in the after school program will engage in lessons where they learn about ethnic historical characters and their influence on history. Student will learn art from a variety of cultures. ASES- Student engage in homework time, themed academic support, and enrichment.